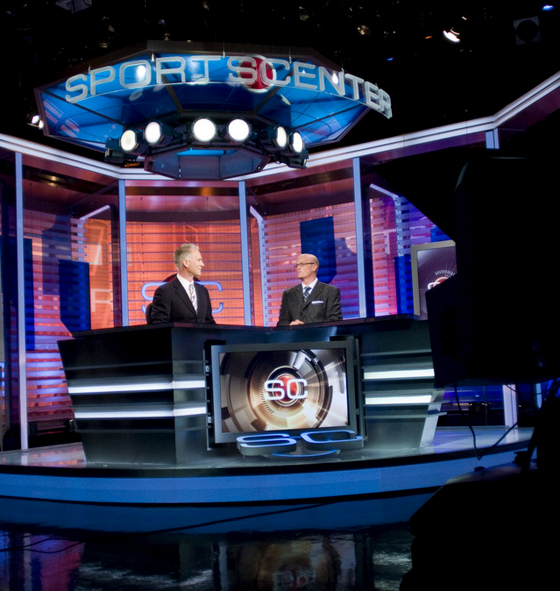 This the final part of our interview with both the designer and the fabricator of ESPN’s new SportsCenter Los Angeles set. Make sure to read part one and part two of this series. NewscastStudio: Once ESPN and Jack Morton PDG tell you that Lexington has won the bid, what are the first steps you take? 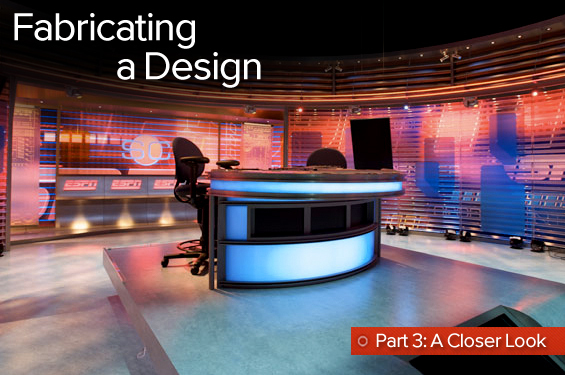 Ron Hubbard: First, I assign a project manager and a technical design team for the project. We lay out all the components, and draw up our technical plans on AutoCAD. Then we submit all our plans for approval to Andre. Once approved, our project manager directs all the work out to our various departments at Lexington — metal, sculpture, props, paint and graphics. We use the most state-of-the-art technology. For example, we precision cut every set element with water jet and DNC. Each step gets checked by three Lexington executives: the project manager, Lexington’s director of production and myself. Then we submit it all for sign-off by Jack Morton PDG and ESPN before we install it. NS: How does the sign-off process work on a practical level, if Lexington’s workshop is in Los Angeles, Jack Morton is in New York and the ESPN management is in Bristol? RH: Well, it’s really pretty easy since we send instantaneous photo documentation to Andre wherever he may be in the world at the moment. He can see our progress and it makes it very easy for him to determine how things are looking in real time. He also schedules a few trips out to L.A. to touch and feel the details himself, and we go over as many of the elements as possible with him when he arrives. NS: Can you tell us about how you achieved the unique lighting effects for this set? The lighting changes more than on most other broadcast sets we’ve seen. Andre Durette: Yes, we wanted to be able to change the mood of the set to advance the storytelling. Through the guidance of our lighting designer Bruce Ferri, we came up with solutions to do this. This included adding a cyc wall behind a printed scrim with a graphic that we designed with the ESPN logo. We printed it in gray scale, and by doing this we could change the color of the graphic by front-lighting the cyc. We created two different looks — one for day and one for night. RH: We also crafted metal louvers and plexiglass louvers to be lit, and these also have two looks of their own. The metal louvers sit on a soffit made with two pieces of 3/4-inch Plexiglas separated by 3-inch I-beams. Then we edge-lit the top and bottom plexi with RGB LEDs, giving a choice of looks. All these varying elements give opportunities to change the mood on the set. NS: How do you get that glass-like quality on the set walls? AD: On the Bristol set, the louvered walls are actually thick plexi. 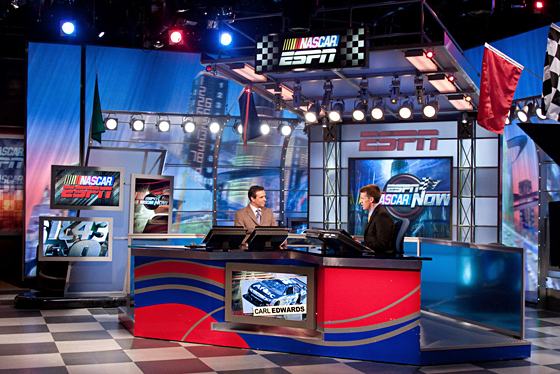 When we first approached the design of the walls for the L.A. set, we worked with Lexington on solutions to create the same glass look in the renderings without actually using 2-inch thick glass that’s used at Bristol. We figured out how to use 1/2-inch thick glass louvers that we frosted on the camera side and then lit with color blasts from below to change color. 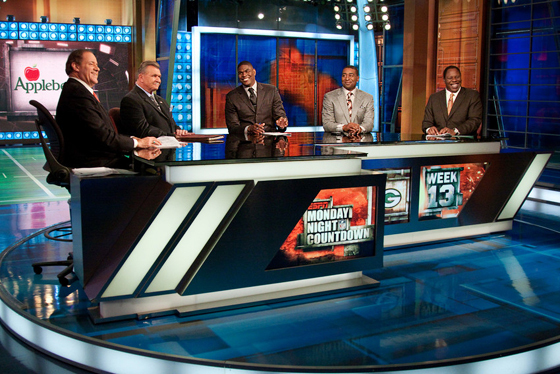 NS: What is your favorite aspect of the SportsCenter LA set and why? AD: My favorite is in the debate area of the studio. 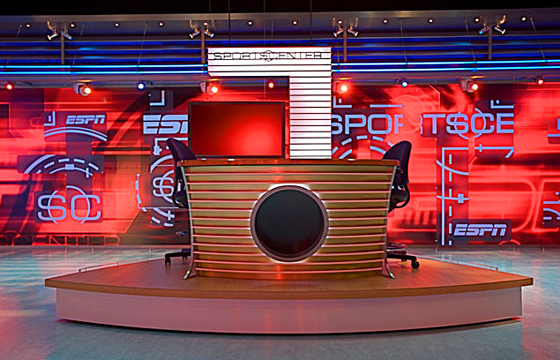 We have these units with the SportsCenter and ESPN logos that look illuminated on these glass panels. These panels appear to be floating. The challenge was to make the logos light up without seeing any wires. NS: And how did you do it? AD: We did a lot of testing, as I had mentioned we do a lot of together with Lexington. We finally achieved this look by using Wildfire, which is a luminescent paint, combined with UV fixtures. It is the same method as a black light, but on a scale of much more grandeur. It was very cool to develop that. RH: I still think the soffits are the best part, since they are built with the solid acrylic plates with the LED lighting. They remind me of the LED message racing across the Staples Center when a Laker hits a big three point shot. We are able to really create a lot of emotional energy with lights. If you missed any part of our series, you can read part one and part two online. Thanks to Andre and Ron for taking the time to speak with NewscastStudio and give us more insight into how fabrication affects set design.